I have always wanted to make baked oysters, ever since I was a young girl and read M.F.K. Fisher’s Consider The Oyster, a mini masterpiece about the bivalve. In the spring, I am teaching this book in my Food Writing class at St. Joseph’s University, so I decided this winter that the oyster would be my pet project. Luckily, Oysters Rockefeller calls for cheese...Parmesan sprinkled over the top. I searched all over for recipes – it seems every famous chef, from Julia Child to Emeril Lagasse, espouses a different version. (Lagasse’s recipe requires green food coloring. Ix Nay.) Most involve oysters, breadcrumbs, spinach, and a splash of Pernod. Yee-haw. I can’t seem to make any recipe without tweaking it, so my version below is a mélange – I based it on the original, from Antoine’s Restaurant in New Orleans, then gleaned a few ideas from epicurious,com, which features 5 different versions. All this goes to say: these were the hit of our family Christmas dinner. With a little champagne, this put everyone in a loving mood. I think I will make this a tradition, as everyone was very eager to help peel potatoes in the kitchen once we’d had a round of bubbly and oysters. On a snowy day, it was a perfect afternoon snack. Combine first nine ingredients in a food processor (or finely chop everything) – you don’t want to grind this too intensely; there should be some chunky bits. Then find a family member with a strong forearm to shuck the oysters, leaving the little mollusk on the half shell. A Madeleine pan makes for a great platter and will keep you from spilling the coveted oyster liquor. Preheat the oven to 450. Then, top each oyster with 1 Tablespoon of the filling and sprinkle with cheese. Bake until browned, about 10 minutes. (If you have leftover filling, you can make a divine nibble by toasting it on a baguette. Serve with lemon wedges, bubbly, and a broad grin. Here it is, this year’s cheese crèche put together by The Brothers Gruyere, a.k.a Andre Darlington and Todd Stregiel, with cut-outs by Jen Holmes. It was regal. It was deluxe. It took us four hours to nibble and break it down. We started locally with a beautiful goat log by Firefly Farms, a melt-on-your-sweater cheese with an elegant, yogurty finish. This was our mellow introduction to a trio of goat cheeses rounding out the barnyard portion of our crèche. Its yule-log shape made for a perfect party kick-off. We followed it up with a pyramid of Valencay, our Star of David – what a knockout. I love anything dusted with ash, and this French sparkler was ethereal: smooth, lemony, light. Think of sweet hay, then package it into something cute. Valencay. After a round of pistachios, we cut into a purse-sized wheel of Drunken Goat, a perennial favorite. This red-wine soaked Spanish wonder makes a great little picnic cheese – it’s fruity and tangy, with a winey edge. Even with piles of snow on the walk outside, it felt meadowy at the table. Should I keep going? Well, we had some Epoisses whiffing up the crisper, so we broke it out to sample alongside the manger, a gorgeous little leaf-wrapped cheese called Banon. When I see this cheese in cases, I have the same reaction that people used to have when they saw Beanie Babies – I squeal and grab it. This cheese has to be one of my top 10 faves, and not just because it’s swaddled in booze-soaked chestnut leaves. I love the consistency. When you peel it open – very dramatic – its fragile rind cracks, releasing the most aromatic fondu. Imagine a savory dulce du lece, yes, there you have it. Drag some crusty bread through it, and you’ve gone to heaven. Banon really is an ideal manger cheese. We couldn’t help ourselves, at this point, we got very riled by a French cow cheese, called Gaperon, which comes wrapped in yellow ribbon and looks like a bloated Christmas ornament. Rob Kaufelt calls Gaperon “the salami of cheese” because it is flecked with garlic and pepper, and it really does make you crave a cured-meat chaser. From Auvergne, this cheese was originally traded for dowries and hung outside of people’s homes to signify wealth. If we had any left, I’d run out and hang it from a stop sign. I want everyone to try this fabulous spiced cheese, which has the creamiest center and the most divine, tissue-thin rind. Some guests might have pooped out at this point, but suspense is the key to a good cheese board, and we had a wheel of perfectly aged Pierre Robert, pocked by three wisemen, that everyone was dying to try. This triple crème is really the Taj Mahal of bloomy cheeses -- ghostly in color, architectural in terms of its rind to really-creamy-middle ratio. We broke out some sour cherries, then sliced ourselves cheesecake-like slivers of this gorgeously runny salt lick. Our moans made the candles flicker. The mouthfeel = a slipper, and the taste calls to mind a mousse made of broccoli sprouts – vegetal glissandos of flavor. But for me, the leaf-wrapped Banon will always be the highlight of Cheese Creche ‘09. Maybe I like the poetry of unwrapping a cheese that looks like something made by caterpillars and finding…ahhhh, molten glory. That’s what the Christmas story is all about anyway, right? Wonder bundled in wonderfulness? Yes, and now, merry cheesemas to all, and may your next cheese be ripe. Today's cheese tasting at Quince is cancelled due to the snow I've been wishing for. Stay home and work on your cheese creche. We'll reschedule in January. I’ve always had a fondness for the nativity – maybe because it’s theatrical, and over the years I’ve made visits to wax nativity museums and sought out the live encampments that appear around town churches in late December. However, I’ve never owned a crèche. Figurines creep me out. And I hate the idea of stuffing the basement full of more holiday ticky-tack. 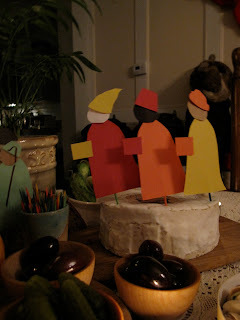 That’s why, two years ago, my family and I started a tradition of the edible cheese crèche. It might sound sacrilegious, but it’s not intentional. On Christmas Eve, we assemble it with care, having selected sheep’s milk cheeses to represent the lambs and strong cheddars to stand in for the wise men. We carve a crude dwelling from a round loaf of bread, and sing carols as we tuck evergreen around the cheese board and tape paper angels to toothpicks for added drama. Then we turn off all the lights in the house and sit around burning candles, telling stories. And feasting. Each year the cheese crèche looks a little different, but we always try to buy artisanal cheeses that support independent farmers, people who work with their hands. To me, that’s the holy part of the holidays – supporting artistry and appreciating all the sweat, milk, and time that goes into cheesemaking. One of my all-time favorite things to eat for dinner is a nibble-and-pick platter. It feels like you’re sitting down to fancy canapés, but really, it’s a just an excuse to work your way through the last, lingering condiments in the back of the fridge. Hmmm…maybe I will work up a cheese-laced diva-ed egg for Christmas this year…what do you think? Blue cheese and bacon? If you are going to skimp, skimp on the stuff in jars. Don’t buy gloomy processed cheese or subpar salami. Trust me. Buy small amounts, but spring for a really good stilton or a really nice Parm. Then go Acme on the jam. Trader Joe’s is a great source of inexpensive pickly things. To recommend: Di Bruno Brothers' Fra Mani Toscano Salami is my fave cured meat of the season -- made with red wine, sea salt, coarse ground pepper. It's so good, I almost want to start a salami blog, but of course I won't...cheese, cheese, all the way, and Cheesemas is just around the corner. P.S. We still have a few slots for our tasting this Saturday afternoon, Dec. 19 at Quince Fine Foods (209 W. Girard). If you want to reserve a spot, call 215-2323425 or email quince@quincefinefoods.com. Put on a big sweater, and come eat some cheese. So, Cheesemas approaches. Until this year, I’d never started off the baking season with anything savory, but this time around it’s different. I have a lot of cheese on hand, and lately, I’ve been eyeing a very veiny block of stilton every time I open the fridge. I love stilton, especially at the Mann Center in June – there’s nothing better than hearing the Philadelphia Orchestra live while crunching down on a huge baguette shmeared with chutney and Colston Bassett. Our friend Emma, a Scottish scientist, used to meet us there, arriving with a blanket under one arm and a backpack full of smelly cheese slung over her shoulder. (The mosquitoes always swarmed the other direction.) Then Emma took off to California to eat oranges and gab in a lab, leaving us stilton-less. To commemorate those days, Dr. E. sent me a stinking mass of cheese for my birthday a few weeks ago. There’s no better birthday present than stilton. Today, I put on some Ravi Shankar and began working my own lab of sorts, baking away in the blue kitchen. I think everyone in Fishtown knows I baked stilton shortbread today because the house is whiffy…wonderfully so. Even the dog is roaming in a stupor. I’m going to take these stiltony biscuits to a potluck tonight, and instead of breaking out the port (which I’d do at home), I’m taking along of jar of onion-fig jam that I’ve been saving for just the right occasion. Truth is, this Mt. Vikos onion-fig jam may be better than my shortbread. It’s so good, my brother still remembers when I served him some two years ago, and he asks for it by name. I was planning to save this jar for him, but alas, the stilton beckons, and these shortbready biscuits need some sort of sweet side. They’re very heady. A stiltony shout-out to Lauren T., of the blog Sensuous Particulars, who gave me the idea to make blue cheese shortbread in the first place. She sent me a Washington Post recipe for walnut-blue cheese cookies; I took a detour into Epicurious because I only had pecans on hand, and friends, the wind is a sourpuss today, and I didn’t want to walk to the store. Instead, I stayed home and rocked some sitar’n stilton. What could be more…cheesemasy? Combine butter, sugar, and salt -- I used a mixer. Add stilton and ground pecans, then mix dough with your hands until the mixture holds together, loosely. It will be dry, the consistency of damp ashes. Mold the dough it into two logs, the thickness of your wrists. Wrap the logs in plastic wrap and refrigerate for an hour. Dance around the house to stay warm, then preheat the oven to 325. Cut parchment paper to fit a large cookie sheet, then slice the logs into quarter-inch rounds. Bake about 20 minutes. Cool before serving with port, figs, dark lipstick. Note: Mt. Vikos Fig-Onion Jam is available at Quince Fine Foods, and at Downtown Cheese in Reading Terminal Market. Last month's tasting at Quince was such a success, we've decided to make it a regular happening. Thanks to a comment from Ann Green, our focus will be on how to pair cheeses. I've got two creamy dreamies for you to sample, including one wrapped in chestnut leaves that can be grilled (woo hoo! ), and a life-changing gouda. Together, these three will make a spectacular holiday cheese board. One of the cheeses even looks like a Christmas tree. When: Saturday, December 19, 2009 4-6 p.m. Cheese or bath bomb? You decide. 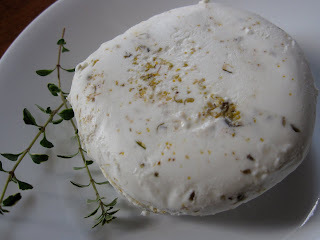 I, for one, am having a love affair with this goaty disk, dredged in fennel pollen and lavender. It’s a good cure-all for a gray-weather hangover, and I’ve been enjoying it for breakfast. It goes nicely with Rose Earl Grey and thin toast. You don’t want to overpower the herbiness of the fennel pollen, which lends a hint of licorice. Licorice and goat cheese? Oh, don’t be irritable. Purple Haze is made by some of the best dairy dreamers in the business, Cypress Grove – makers of the legendary Humboldt Fog. One of their most recent creations, Truffle Tremor, was featured on this blog when it won top honors at this year’s Fancy Food Show in New York. The folks at Cypress Grove don’t mess around. Founded by Mary Keehn (a goat hobbyist turned breeder), this California cheese company is recognized as the premier artisanal goat-cheese maker in the country. If you’re on a quest to learn about artisanal cheese in America, Cypress Grove is a good place to start. In fact, this month Cypress Grove is running a holiday special, where you can have three of their award-winning cheeses over-nighted in a tote bag for just under $50. Pretty cute. A good gift for the tough-to-please foodie on your list. The special includes a wedge of Truffle Tremor, a wheel of Fog Lights (a mold-ripened cheese, covered in ash), and an herbed chevre. Tonight, I’m going to try a recipe off the web site: Purple Haze-stuffed figs, served warm, with honey. Meow. It’ll be perfect to serve to a few food nerds who are coming over for a game of Agricola – my other recent obsession. Think wooden animals. Think Euro games. Hey, if I can’t have my own goat farm, at least I can pretend. Plus, the game pieces look kind of like cheese cubes. My grandparents, who are from Switzerland, always hosted Raclette parties around the holidays, filling their Cleveland house with the smell of strong cheese and boiled potatoes. As a child, my favorite part was sitting around the Raclette grill, an electric table-top device, and using my own little fry pan to toast bite-size portions of a meal that lasted several hours. It was a thrill to watch the adults do the same, as if we were all partaking of an Alice in Wonderland-style event around a Holly Hobby Oven. Raclette is a cow’s milk cheese made on both the French and Swiss side of the Alps. It melts beautifully, and its strong flavor is tempered by heating it. This is a semi-stinker, nothing to be afraid of; if you like Morbier, it’ll go down easy. Many cheese shops and groceries stock Raclette (and even raw-milk Raclette) around the holidays. In December, I always host several Raclette dinners. It’s a cheap, easy way to entertain – once you buy a Raclette oven (about $99 from Swissmar) – and friends always remember it from one year to the next, and request it. The 8-person Swissmar Classic Raclette Grill I bought a few years ago is really a dream, since it comes with a grill top – perfect for roasting wursts as a second course. So, how does a Raclette party work? First, you can only invite as many people as your Raclette grill can handle (most grills come with 6 or 8 little pans). Then you ask everyone to bring a condiment; cured ham, pickled onions, cornichons, and baby corn are the traditional add-ons. My grandmother always served chopped scallions, my mother always provided a dish of chopped, sweet red pepper. As the host, your only real job is to boil a big pot of red potatoes and slice up a hefty wedge of Raclette. When guests come over, break out the lager, and fire up the Raclette oven. Then plan to sit around toasting slices of cheese on top of boiled potato-halves for, oh, the next two hours. Between cheesy bites, guests can snack on pickled condiments. If you’ve invited some impatient carnivores, you can offer them sliced sausage and raw onions to grill on top of the oven, or you can create a separate course of marinated veggies or shrimp. After dinner, our family always plays a traditional game, passed down from my Swiss grandparents. We call it “The Chocolate Game.” When the Raclette grill is put away, we set out a whole dark chocolate bar on a cutting board, and everyone at the table receives a fork and a knife. Then we pass a dice. Anyone who rolls a 6 may eat the chocolate bar, using the silverware, but only until someone else rolls the lucky number. The game goes on until the chocolate bar is gone. Usaully, there is some hysteria involved. Raclette grill+chocolate game=perfect holiday meal with very little cooking. It’s also a great way to stay warm when the temperatures drop. Just pretend you are in the Alps.